Venice is unquestionably one of the world’s most beautiful and fascinating cities. Finding an authentic meal while avoiding all of the tourist traps is a bit like navigating the labyrinth maze of small, winding roads that run through the city. It takes work and a little inside knowledge. 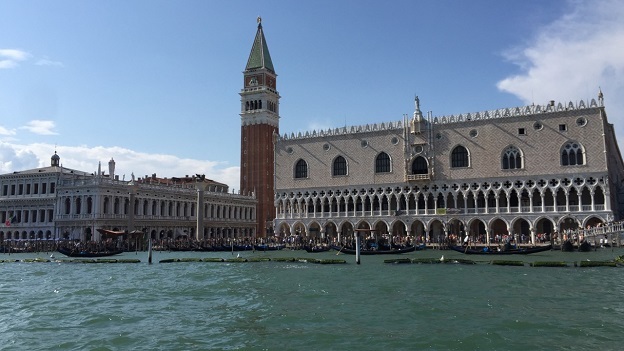 In anticipation of a trip to Venice, I asked our man on the ground, Ian D’Agata, for help. Corte Sconta is a fabulous place to stop by for a simple but delicious meal. The ambience is quite informal and unfussy. Guests can sit inside or enjoy al fresco dining when the weather permits. The small menu is based on the local catch and features a host of local specialties, all prepared authentically. Prices are reasonable for Venice. 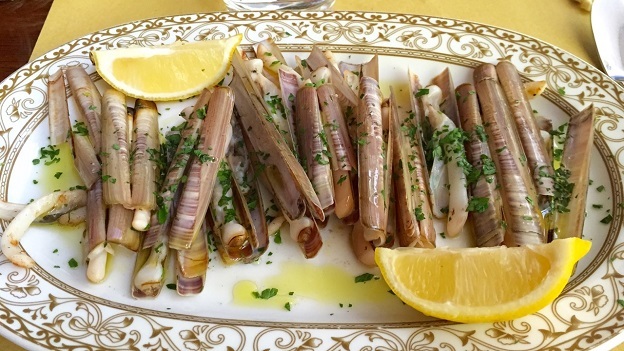 My grilled razor clams taste like they have just come out of the sea. 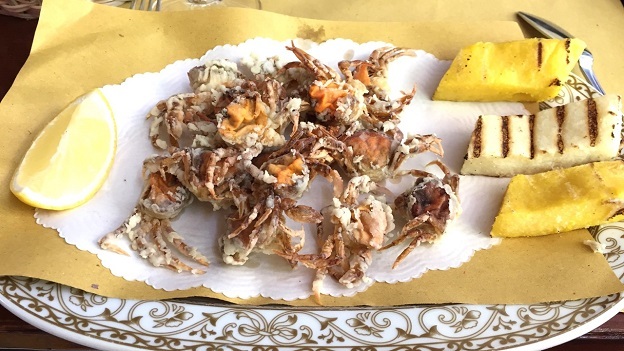 The fried moeche, tiny softshell crabs that are found only here, in the Venetian lagoon, are a real treat. Both pastas are terrific. 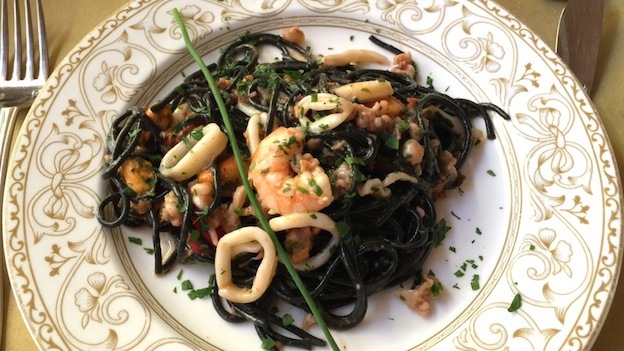 The spaghetti alle vongole, a standby of the coastal Italian kitchen, is delicious, but I like the squid ink pasta with seafood (spaghetti al nero di seppia e frutti di mare) even more. The flavors are bold, lusty and deeply satisfying. One of the things I love most about eating in Italy is that even the simplest trattorias often have extensive Champagne selections. 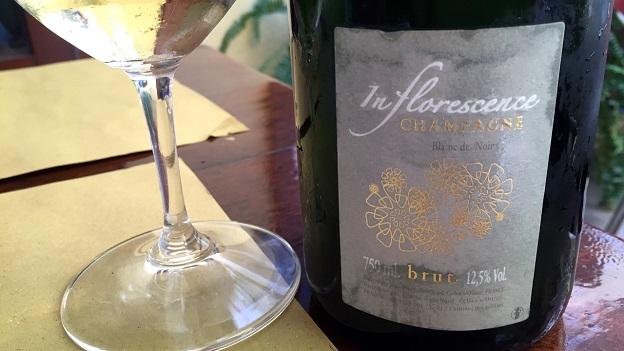 Quite remarkably, Italy, with its 60 million inhabitants, is one of the top 5-6 markets for many Champagne houses, and was one of the first countries to embrace the grower Champagne culture. American readers frustrated with sourcing Selosse Champagnes will have no trouble finding those wines in Italy. This is Selosse’s number one market. But on this warm, muggy day, something lighter is more fitting. Cédric Bouchard’s 2010 Blanc de Noirs Val Vilaine is in great shape. Bright and finely cut, the 2010 Val Vilaine works beautifully with the seafood, refreshing the palate with each taste. It is a sublime bottle to enjoy over a simple and leisurely lunch. Overall, the list is pretty boring, with very few choices among more local wines such as Soave, and not much in the way of imagination, which is a shame given how delicious the food is. All things considered, Corte Sconta delivers an authentic informal Venetian dining experience at fair prices, which makes it noteworthy for readers visiting this most magical of Italian cities.